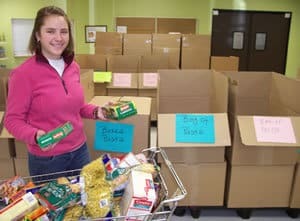 We have 3 major food drives throughout the year: the March campaign which includes the Boy Scout Food Drive, the Postal Worker Food Drive in May and 10 Days of Giving in December. However, food donations are needed and accepted all through the year. You can bring your donation to the door located in the back of the food shelf building. Please make sure the food item you are donating is unopened and has not exceeded its expiration date. You notice that your local food shelf is having a food drive so you start searching your pantry for a donation. You think to yourself, surely someone will eat this can of beets I’ve had in the cupboard for a couple of years, right? Wrong. Before cleaning out your cupboard consider the following list of needed items. Cash. For every dollar you donate, the food shelf can purchase many more dollars of food from the central food bank.